The California Baptist University Art Gallery in downtown Riverside hosted “A Beautiful Lie” — a show featuring paintings by artist and painter Regina Jacobson — from Jan. 14 to March 4. At their core, Jacobson’s paintings portray humanity within the context of fashion. Jacobson was involved in the fashion industry for 33 years prior to picking up a paintbrush in 1999. The art featured in the gallery mainly depicted work she completed after she received her master’s degree in 2013. Through this collection, she combines her artistry, fashion experience and Christian beliefs. The result is symbolic paintings that pull ideas from literary works such as J.R.R. Tolkien’s “Lord of the Rings,” Dante Alighieri’s “Dante’s Inferno,” C.S. Lewis’ idea of the inner ring and the Bible. The theme of entrapment Jacobson uses in her paintings is drawn from the book of Jeremiah, in which the Israelites become enslaved because they chose to worship false gods and depicts the result of this idolization of fashion as entrapment. “In the fashion industry I felt like the fashion was the god,” Jacobson said. Jacobson said the idea of the inner ring is a measurement to which individuals see themselves as accepted or rejected. The idea of the ring of power, from Tolkien’s works, depicts another ring forged of greed and desire for status — that what the culture teaches is achieved through a perfect body image. Jacobson pulls the idea of a circle being a confinement from “Dante’s Inferno” and depicts imprisonment through the levels of hell. This circle is shown in a presentation of the objects she has pulled from for inspiration in the gallery. 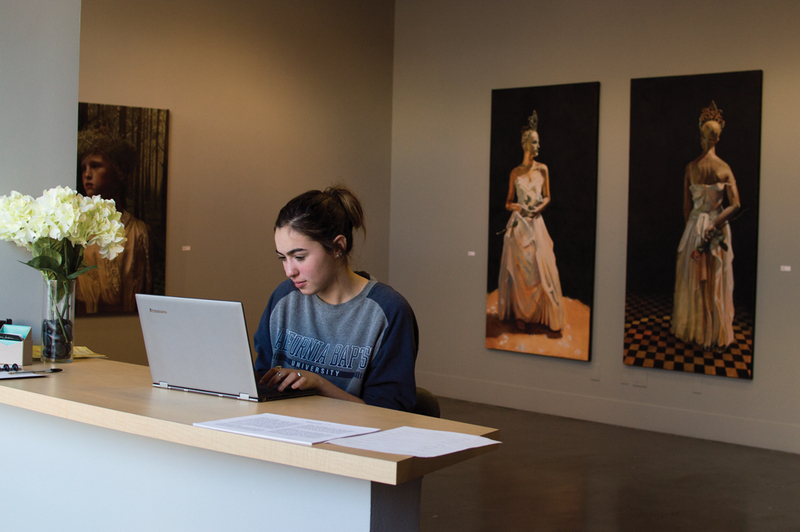 “It’s for us to see the pieces that she used in her other paintings,” said Bailey Dahlgren, junior biology major and student worker at the gallery. Duncan Simcoe, professor of visual arts and co-director of the CBU Art Gallery, said the work in this specific collection provides an oppositional voice to the idea of the culture’s inner ring. Jacobson said through this art collection she wants women to think about where the idolization of fashion and body image leads.